The iPad Pro was built with serious productivity in mind. Meet the most powerful iOS device ever. With specs to rival even some Macs, the iPad Pro has the potential to become a serious productivity machine. Even though the iPad Pro won’t be available until November, Apple has shared a lot of information about the design and the technology that went into building the device. 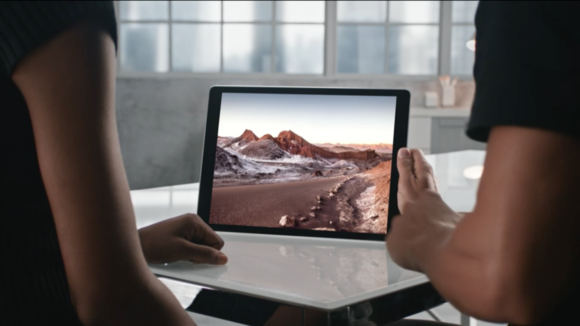 Here’s what we know so far about the iPad Pro, the most powerful iOS device ever. When and where will I be able to get it? The iPad Pro will be available for purchase starting in November on Apple.com, in Apple Stores, and via select carriers and authorized resellers. Apple hasn’t yet shared a specific date or pre-order information, although 9to5Mac is predicting a Wednesday, November 11, launch both in stores and online. The most powerful iPad has a price tag to match. iPad Pro starts at $799 for the 32GB model with Wi-Fi, goes up to $949 for the 128GB model with Wi-Fi, and costs $1079 for the 128GB model with Wi-Fi and cellular capabilities. Wait, so I can’t get a 32GB cellular model? Nope. Not according to what Apple shared today. You must pony up for a 128GB iPad Pro if you want to jump on the Internet without WiFi. What colors does iPad Pro come in? Silver, Gold and Space Grey. No, but can you imagine? Is it bigger than previous iPads? 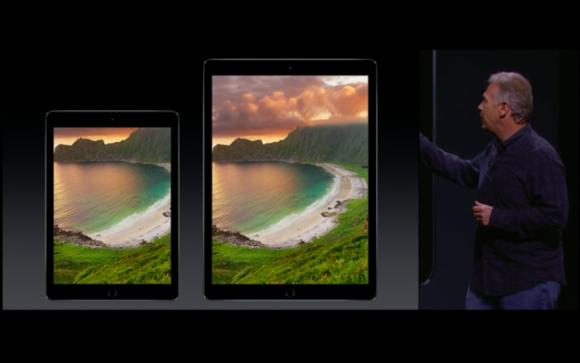 To say the iPad Pro is bigger than other iPads would be an understatement. While the screen on the iPad Air measures 9.7 inches diagonally, the iPad Pro’s screen is more than 3 inches larger, measuring 12.9 inches. 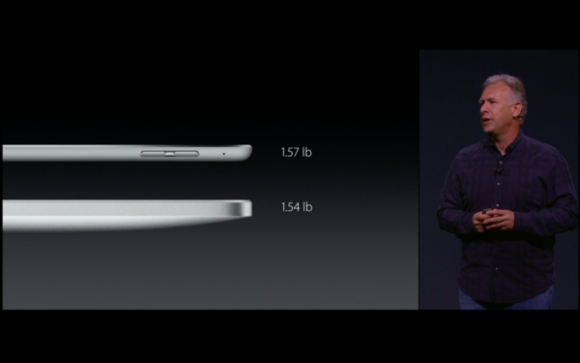 That’s 78 percent more display area than that of iPad Air 2. The larger sizing is not arbitrary, however. Half the width of the iPad Pro is exactly the height of the iPad Air 2—a perfect geometry for running apps side by side. That’s a lot of screen size, but how does the display look? It looks good. The iPad Pro fills up its large screen with 5.6 million pixels in a 2732x2048 resolution (versus the 2048x1536 resolution of the iPad Air 2), making it the highest resolution Retina display Apple has ever produced for a portable machine, even besting the resolution of the 15-inch MacBook Pro. The iPad Pro also boasts double the graphics performance of iPad Air 2, making it ideal for watching movies and playing video games. Wow. But should I be worried that the sound quality won’t be as good? Only final testing will tell, but the specs are promising. iPad Pro is equipped with four speakers, one near each corner to create an immersive “soundstage” experience. These speakers have also been programmed to produce a well-balanced sound, whether you are holding the iPad Pro vertically or horizontally. And a new casing design gives the Pro speakers 61 percent more back volume, a wider frequency range and up to 3x more acoustic output than previous iPads. Ok, so it’s bigger and louder, but is it faster than previous iPad models? The iPad Pro boasts Apple’s new A9X chip, which has twice the memory and is 1.8x faster than the A8X chip in the iPad Air 2. Apple calls this “desktop-class performance,” so you’ll be able to do things on the iPad Pro that you previously reserved for your Mac. Additionally, Apple has updated the storage controller so you can quickly open large files, like 4K video, hi-res photos from your DSLR, or that seemingly endless PowerPoint presentation your boss wants you to edit. Let me get this straight: higher resolution, better graphics performance, faster CPU... will all this drain the battery life in no time? Not necessarily. Apple claims that the iPad Pro boasts 10 hours of battery life (9 hours if using cellular), just the same as the iPad Air 2. Ok, yes. The iPad Pro is a bit thicker and heavier than its previous Air 2 counterpart. But not significantly considering all the improvements. The Pro is 6.9 mm thick (the Air 2 is 6.1 mm), and it weighs 1.57 pounds (the Air 2 weighs 0.96 pounds). Did the Pro keep any features or specs from the Air 2? It kept plenty: Multi-Touch display, 8-megapixel iSight camera, 1080 HD video recording capabilities, 802.11ac Wi-Fi technology with MIMO, Touch ID, LTE and Apple SIM. Please note that 3D Touch, just introduced in the new iPhone 6s and 6s Plus, is not available on iPad Pro. Are there any new QuickType shortcuts? iOS 9 introduces formatting buttons to the QuickType bar so that you can italicize, copy/paste or add attachments with just a tap. Another cool way to select and edit iPad text on iOS 9 is to simply place two fingers on the touchscreen. This turns the screen into a trackpad that you can use to select text by dragging. Furthermore, third-party apps can customize the shortcuts that appear on the QuickType toolbar, so that you can have all the important buttons right at your fingertips. I heard I can now have two apps open at the same time. How does that work? There are three ways to view and interact with two apps simultaneously on an iPad Pro in iOS 9. First, we have Slide Over, where you can choose a second app to open up as a pinned sidebar on the right. Second, there’s Split View, where two apps take up half of the screen. Finally, Picture-in-Picture lets you watch a video or chat on FaceTime while having another app running in the background. The video screen becomes a smaller window that you can drag and resize. How does the Smart Keyboard work? 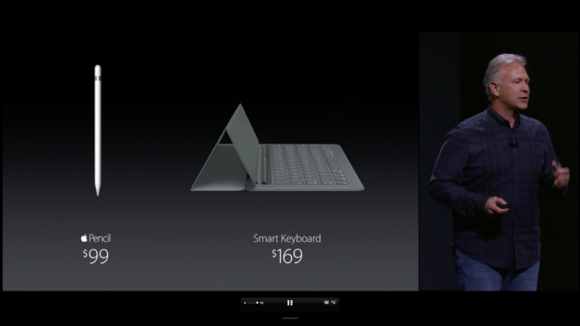 Think of the iPad Smart Cover but with a slim, foldable, lightweight, water-resistant, 4 mm keyboard built in. 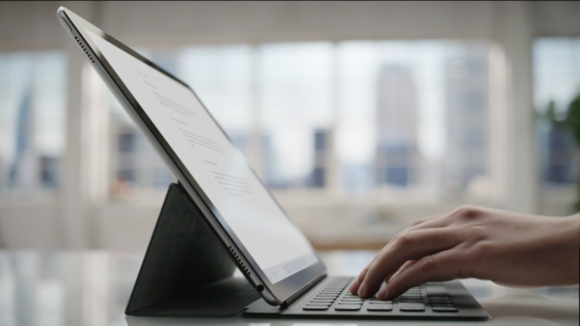 In addition to using it to type, you can fold up the Smart Keyboard to prop up the iPad Pro or cover up the screen completely. How do you hook it up to the iPad Pro? Apple has created a new three-pronged Smart Connector that allows for the Smart Keyboard to be connected to the iPad without plugs or wires or Bluetooth pairing. It’s similar to how the Apple Watch’s diagnostic port works. The Smart Connector allows for the seamless transfer of data and power between devices, so you won’t have to charge the Smart Keyboard. Hmmm... sounds a lot like the Surface tablet keyboards. How much does the Smart Keyboard cost? 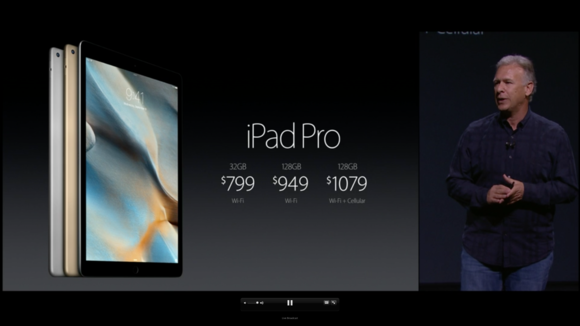 You can get it for $169 starting in November. And what’s so special about Apple Pencil? 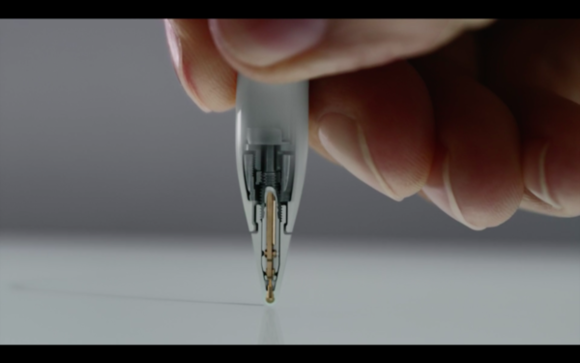 Apple’s first stylus for the iPad Pro is pretty self-explanatory. 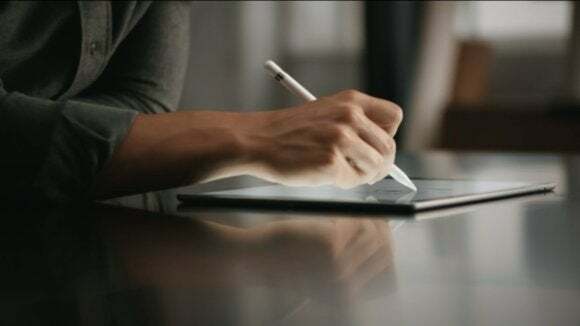 You can use it to add handwritten notes to your digital documents, but it’s also got some cool technology that will be particularly intriguing for sketch artists. Apple Pencil has several sensors on both its case and the tip that can detect the position, pressure, angle, and orientation of your strokes. Draw gently on the screen to create light strokes, or press down to draw thicker lines. Two sensors on the tip work with Multi-Touch display to detect whenever you’re tilting the Pencil to create a shading effect. Apple Pencil can also be used simultaneously with your fingers, too, for those who have yet to graduate past the finger paintings stage. How do you charge Apple Pencil? Instead of an eraser, the Apple Pencil boasts a Lighting connector. Simply take off the cap and plug the Pencil into your iPad Pro. Fully charged, Apple Pencil lasts up to 12 hours. And just having the Pencil charging for 15 seconds will get you 30 minutes of sketching time. Yes, Apple also has new Smart Covers and Silicone Cases to outfit your iPad Pro. The Smart Cover comes in two colors: charcoal gray and white.